The stakes of childhood hunger are high: the effects of poor nutrition are devastating to growing children. Hunger pangs, poor concentration, and the social and emotional stresses of poverty interfere with learning both in the short- and long-term. Children of low-income families can also face obesity-related health issues that result from eating unhealthy foods, which unfortunately happen to be the cheapest, if not the only, available foods in some neighborhoods. Child nutrition programs that are both functional and easily accessible go a long way toward helping low-income and poor families save money – money that they can use for household expenses, transportation, and other necessities. Through direct advocacy and community outreach we aim to extend the reach of existing federal and state child nutrition programs. We also help devise new and innovative ways of getting healthy food into small hands. Stay informed about our efforts to make sure children get the food and nutrition they need to be happy and healthy. We are helping local school districts participate in an Obama administration federal program – the Community Eligibility Provision – that funds free meals for all school children in low-income districts. We continually advocate to strengthen the nation's Supplemental Nutrition Assistance Program (SNAP), or"food stamps." 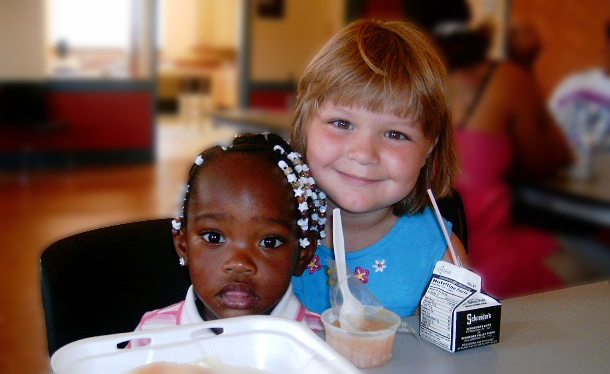 This essential program helps keep children fed and lift working families out of poverty.